One of the games our family played while camping during Memorial Day weekend was Bocce Ball. 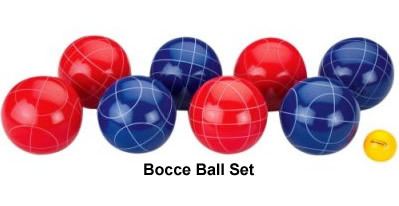 If you have never played bocce ball or have never seen it played, it is a form of lawn bowling. Balls are tossed or rolled at a target. Whoever is closest to the target scores points. To see a demonstration of how the game is played, click on the youtube video link below. The game was first played in Italy and is traditionally played on oyster shell courts. Our family plays a version that is called the West Coast Style which means it isn't played on a court but instead in an open grassy area, although we also play it on the beach. It is a great game for camping because it can be played anywhere there is a little bit of open grassy area. We usually have enough space to play it right at our campsite, but I do want to give a word of caution. The balls may look harmless but they are heavy so care needs to be taken to play away from camping units and other people. The ball hurts if it hits someone. Although the game is intended to be played on flat ground, our family never lets a little bit of uneven or hilly ground stop us. And, if the area we have to play in is small, we don't throw the target ball very far. If we have lots of space then we will toss it further away although it is challenging at any distance. I think it is most challenging and fun when the distance the target ball is thrown each round varies. Our family's technique varies according to the surface we play on. A toss with a roll is best for grassy surfaces where a ball is almost guaranteed to roll a little. On sand the ball usually comes to a dead stop when it lands so an accurate toss is essential if a person wants to score any points. It can be played with single players or teams of players. This weekend we played with four teams of two and then with 3 individual players later on. It is easy to adapt to the number of people playing. The game is available at stores such as WalMart and Target during the summer months and can be purchased online any time of the year. Prices range from about $20 up to about $100. The set pictured below is available through Amazon. When purchasing a set to play while camping, I suggest buying one with brightly colored balls that will be easy to see on the grass.